Welcome to my "Strength and Comparison" article for the coming month. The article "Ranking, Rating and Score" has also been published. 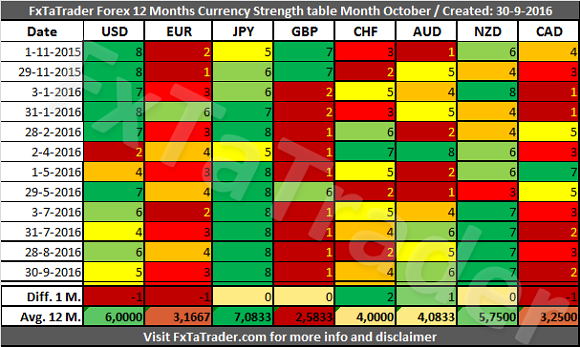 When looking at the Currency Strength in the table here below we can see that the CAD lost a lot of strength in the last 4 months. The NZD and the AUD became stronger in the last 4 months. For more details read both of my articles where the relevant Charts and Tables are provided. Average: AUD, CHF. The preferred range is from 4 to 5. In the last 4 Months the NZD became stronger being the second stronger currency after the JPY. According to the Currency Strength table above the Avg. 12 M. of the NZD is close to the USD which is a strong currency. The Score of the NZD is also far from the other average currencies. For that reason the NZD changed classification from Average to Strong. 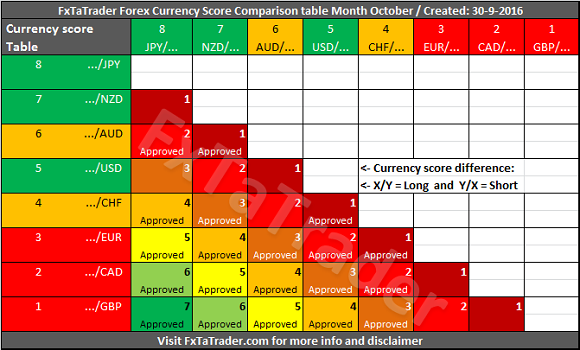 Here below you can see the Monthly Currency Score Chart with 2 years data as a reference. In the last 4 Months the AUD became stronger and it has at the moment a higher Avg. 12 M. than the CHF which is an Average Currency. The Score of the AUD is also far from the other weak currencies. For that reason the AUD changed classification from Weak to Average. Even though currencies may be in the same category a currency may be in a weaker/stronger period and may even change its classification in the future. See the current classification for the coming period at the beginning of this article. Currencies with a high deviation seem less interesting to trade because they are less predictable. There are no curencies at the moment with a high deviation. 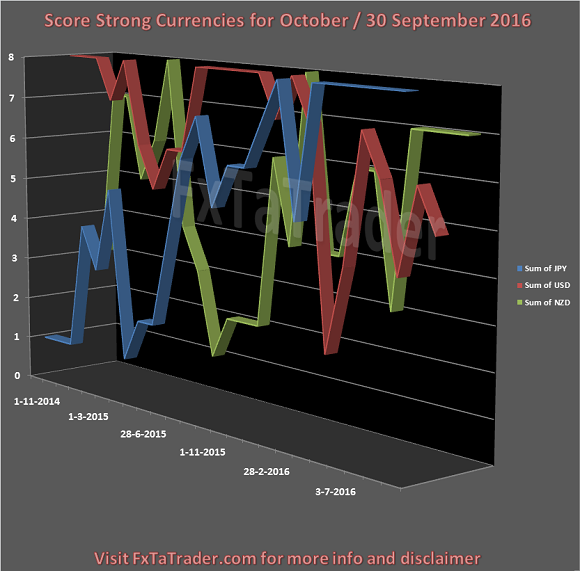 Besides this article I also use the Forex "Ranking, Rating and Score" which is also available once a month on my blog at FxTaTrader.com. In the article "Ranking, Rating and Score" we look in more detail at the absolute position of the currencies and pairs.